Here comes the bride, all dressed in white – and surrounded by art deco geometry. 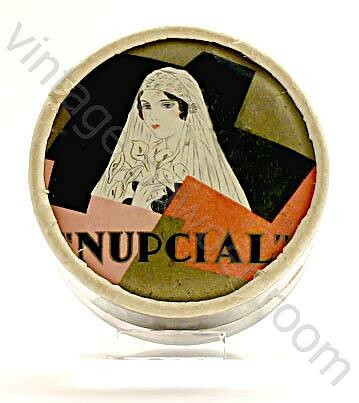 The bride on the Nupcial face powder box is dressed for a wedding in the late 1920s or early 1930s. She’s wearing a cloche style headdress, her hair is bobbed, and her bee-stung lips are painted a vivid crimson. She represents a typical bride of the time, and she is obviously wearing make-up. Commercial cosmetics were a recent phenomenon in the 1920s and 30s. Prior to that time women had passed recipes for kitchen cosmetics and skin preparations to one another. The recipes were often contained in cookbooks which were given as gifts, or handed down from mother to daughter. When the Nupcial bride was walking down the aisle, whether or not to “paint and powder” was still the subject of contentious debate. The bride in the photo looks radiant and deliriously happy, or maybe just delirious; but what about the darker side of brides? 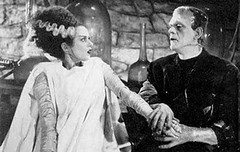 For the noir side of brides we need only to look at the 1935 film, “Bride of Frankenstein”. Elsa Lanchester may have been one of the most reluctant brides ever. She took one look at her intended mate, Boris Karloff, and let out an ear piercing shriek of terror. Not exactly an “I do”. I always feel sorry for the monster – look at his face, he was obviously smitten, and you can see why, Elsa made a lovely bride – even with the lightening bolt of white in her hair, and the extensive scarring on her neck. They may look benign in their beautiful gowns; with their hair perfectly coiffed and their makeup flawlessly applied, but brides can also be serial killers! 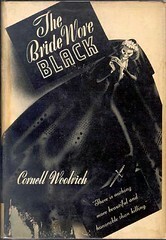 The bride in Cornell Woolrich’s novel was widowed on her wedding day. She was not about to let the murderers escape justice, and the novel tracks the homicidal nearlywed as she lures, ensnares, then bumps off the five men who ruined her life. 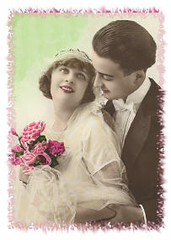 What the homicidal bride doesn’t know about the death of her groom is revealed in a contrived twist at the novel’s end. Although he was not the same caliber of writer as either Raymond Chandler or Dashiell Hammett, Cornell Woolrich was one of the fathers of the 20th century crime novel. He penned the story Rear Window which became the great Alfred Hitchcock film of the same name. Woolrich was a profoundly unhappy man. He was a self-hating homosexual and was a groom one time only. 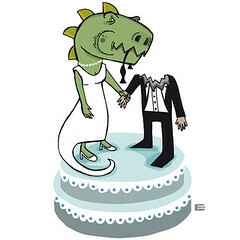 He may have been even more hesitant to walk down the aisle than Frankenstein’s intended. On a whim, he married the daughter of a movie mogul. The marriage was not consummated, and after a desperate phone call from his mother who claimed that she couldn’t live without him, he moved in with her and never left again. Even in these enlightened times, wearing white and walking down the aisle with the man of your dreams seems to be a national obsession. There are TV shows devoted to brides behaving almost as badly as the woman in Woolrich’s novel. These women are the notorious “Bridezillas”. Nothing makes them happy – neither the dress, nor the catering, and perhaps not even the groom. They roar and stomp, and generally make life miserable for all those with whom they come in contact. I’d rather face a starving raptor. I think that the preoccupation with over the top weddings is a component of the nation’s other reigning mania – the desire for fame. It seems as if everyone wants to star in her or his own movie, or share space with a “celebutante” on the cover of a supermarket tabloid. My groom and I opted for a small retro style wedding. 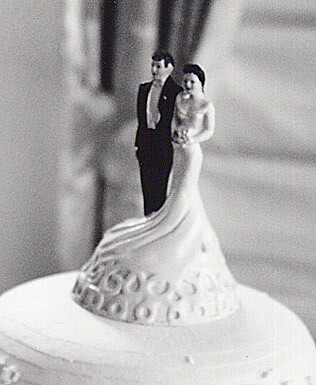 The elegant vintage cake topper was a flea market find and suited the theme of my wedding perfectly. I will always cherish it.